We started our ‘journey’ 3 years ago, when I was almost 41. We had only been together about a year, and like most people who meet later in life, thought we’d better ‘get on with it.’The word ‘journey’ makes me cringe, as before this, to me a journey meant going somewhere exciting, with all the stuff you needed in your suitcase, whereas this journey starts to feel like getting on a bus to an unknown destination with a suitcase full of the wrong clothes, that gradually gets heavier and heavier as you fill it with more and more useless crap!Like a lot of couples, we started off quite blasé, with a ‘Let’s see what happens’ attitude. Looking back, I’m amazed that we didn’t even take supplements for ages, and I didn’t bother properly tracking ovulation! After about 9 months, I started to put my practical mind and organisational skills to the task. We finally started taking supplements, and I started taking my temperature to track ovulation blablabla. Later that year, we finally got tests done, with the oh so common tedious diagnosis of unexplained fertility with a side order of ‘it’s probably just your age.’ Meanwhile our friend of 43 got pregnant within 3 months of trying and now has a one year old. I was lucky enough to speak to someone at the Fertility Show who introduced me to Naomi and I joined the Embrace Fertility support group and through that, I started the online stress reduction course with the philosophy of getting happy while ttc. This gave me some interesting ideas and techniques to try and I felt like I was getting somewhere. During this time, I had my first pregnancy but before I knew it, it was gone at just 6 weeks. I felt like it had been my ‘last chance’ but all the wonderful women in the FB group assured me it wasn’t and shared their own stories and kind words. I also read ‘Spirit Babies’ which I found a nice way of looking at things. So I got over it and we carried on, as you do. I cut out alcohol almost completely but continued to struggle with my love of coffee – I have always associated it with a little break away from work, a moment to pause and let my thoughts drift. For some reason, I just couldn’t give it up completely. So another reason to feel guilty.Guilt is an emotion that characterises lots of women’s experience of infertility (another word I hate) and I am still battling with it. I would look at the FB page and think ‘Why don’t I want to try IVF like everyone else my age and younger seems to?’, ‘Why do I still want to do things for myself, like run off to Peru and do voluntary work?’. In fact, last year was a breakthrough year for me, as I took voluntary redundancy from a job that had made me angry and stressed for a few years and went to Peru for 6 weeks to work with children. However it took a lot for me to make that decision as it meant taking precious time out from ttc but luckily I have a wonderful supportive partner. When I came back, we finally started to look into IVF, although I always felt uneasy about it. I hated being written off because of my age (I was now 43) and I hated the clinical biological nature of it. But I had finally managed to do most of the stuff you’re ‘supposed’ to, like giving up gluten (OMG I love bread) and dairy with the help of a fabulous nutritionist and I was stress-free from not working, so it seemed like a good time. We investigated ‘Natural IVF’ but the more we learnt, the more unnatural the whole process seemed. Because of my age (what else! ), there were some drugs involved and they recommended ‘harvesting’ (ugh) eggs over 3 months so it felt like a long time out of trying naturally. I overrode my intuition which felt repulsed by the whole process, driven by guilt that my partner would think I didn’t want to try everything possible. So we booked a scan with the fertility clinic. It happened to be day 15 of my cycle and we could see the bulging ovary about to release its juicy egg ready to be fertilised by my partner’s horny sperm. For the first time, I felt truly fertile and thought ‘oh please let it be this time’ and guess what – it was! Early in the New Year (this year), I found out I was pregnant again. Of course we were delighted – ‘a second chance!’. I felt unbelievably smug to have cheated IVF and so happy not to have to go through with it. At the time, I was doing an online course (I’m an addict) with lots of spiritual visualisations about your spirit baby and felt so in sync with my unborn baby and even had a name picked out based on a ‘vision’ I’d had. And then I miscarried again, at 7 weeks. Weirdly, although of course we were heartbroken, I felt like I moved on quite quickly and guess what? I felt guilty about it! I decided then it was time for a new approach – practical techniques and spiritual visualisations hadn’t done it so I turned to cognitive hypnotherapy and started a 3 month one-to-one programme with Russell Davis www.thefertilemind.net, focussing on Project You, hoping Project Baby would take care of itself. In fact, this has been immensely helpful and although Project Baby hasn’t come along yet, I’m starting to nurture my own babies. 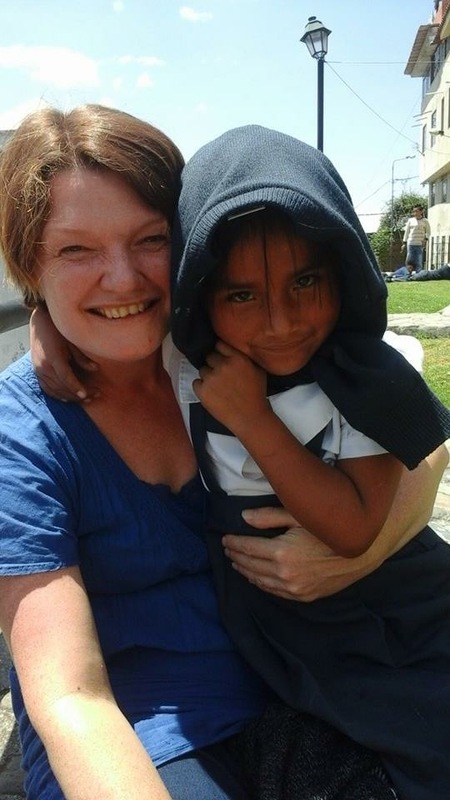 For example, I’m applying for a Master’s course in International Child Studies, inspired by my experiences in Peru. Through the work I’ve been doing, I realise that the Giant Evil Baby doesn’t exist, I’ve made it up. Sounds obvious but I’ve only just properly realised it. The concept of spirit babies isn’t useful for me as my failed pregnancies, rather than just being a collection of cells that weren’t viable, have become souls that didn’t want to be born. I started to feel like there was some test I had to pass first and I didn’t know what ‘they’ (who don’t exist) wanted in order to stick around. So perhaps the concept of spirit babies is useful for some people, but it isn’t for me. The fact that some of my friends at a similar age conceived easily doesn’t mean they were more enlightened or in tune with their soul or more deserving, they were just lucky. It’s as simple as that. The fact that they conceived easily doesn’t mean anything to my situation or future, good or bad. It’s only what I think about it. I would like to conceive naturally and have a healthy baby but if it doesn’t happen, my partner and I will work it out with the resources and knowledge that we will find if we need them. Life will go on and there will be other sources of happiness. So my journey’s not over yet, but I’m more excited about where the bus is taking me, and I have thrown away some of the crap in my suitcase! Do you have a giant evil baby lurking over you? Leave a comment below or come and join the conversation within our fertility support community.